FREEHOLD, a town and the county-seat of Monmouth county, New Jersey, U.S.A., in the township of Freehold, about 25 m. E. by N. of Trenton. Pop. (1890) 2932; (1900) 2934, of whom 215 were foreign-born and 126 were negroes; (1905) 3064; (fob) 3233. Freehold is served by the Pennsylvania and the Central of New Jersey railways. It is the trade centre of one of the most productive agricultural districts of the state and has various manufactures, including carriages, carpets and rugs, files, shirts, underwear, and canned beans and peas. The town is the seat of two boarding schools for boys: the Freehold Military School and the New Jersey Military Academy (chartered, 2900; founded in 1844 as the Freehold Institute). One of the residences in the town dates from 1755. A settlement was made in the township about 1650, and the township was incorporated in 1693. In 1715 the town was founded and was made the county seat. 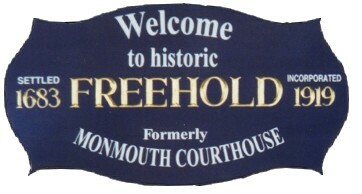 It was long commonly known (from the county) as Monmouth Court-House, but afterwards took (from the township) the name Freehold, and in 1869 it was incorporated as the Town of Freehold. An important battle of the War of Independence, known as the battle of Monmouth, was fought near the courthouse on the 28th of June 1778. A short distance N.W. of the court-house is a park in which there is a monument, unveiled on the 13th of November 1884 in commemoration of the battle; the base is of Quincy granite and the shaft is of Concord granite. Surmounting the shaft is a statue representing "Liberty Triumphant" (the height to the top of which is about 100 ft.). The monument is adorned with five bronze reliefs, designed and modelled by James E. Kelly (b. 1855); one of these reliefs represents " Molly Pitcher" (d. 1832), a national heroine, who, when her husband (John C. Hays), an artillerist, was rendered insensible during the battle, served the gun in his place and prevented its capture by the British. Her maiden name was Mary Ludwig. "Molly Pitcher" was a nickname given to her by the soldiers in reference to her carrying water to soldiers overcome by heat in the battle of Monmouth. She married Hays in I 769; Hays died soon after the war, and later she married one George McCauley. She lived for more than forty years at Carlisle, Penn., where a monument was erected to her memory in 1876. Joel Parker (1816' 1888), governor of New Jersey in 1863~1866 and 1872~1875, was long a resident of Freehold, and the erection of the monument was largely due to his efforts. A bronze tablet on a boulder in front of the present court-house, commemorating the old courthouse, used as a hospital in the battle of Monmouth, was unveiled in 1907. Freehold was the birthplace and home of Dr. Thomas Henderson (1743 -1824), a Whig or Patriot leader in New Jersey, an officer in the War of Independence, a member of the Continental Congress in 1779 -1780, and of the national House of Representatives in 1795 -1797. The name Freehold was first used of a Presbyterian church established about 1692 by Scottish exiles who came to East Jersey in 1682 -1685 and built what was called the "Old Scots' Church" near the present railway station of Wickatunk in Marlboro township, Monmouth county. In this church, in December 1706, John Boyd (d. 1709) was ordained, the first recorded Presbyterian ordination in America. The church was the first regularly constituted Presbyterian church. No trace of the building now remains in the burying-ground where' Boyd was interred, and where the Presbyterian Synod of New Jersey in 1900 raised a granite monument to his memory; his tombstone is preserved by the Presbyterian Historical Society in Philadelphia. John Tennent (1706-1732) became pastor of the Freehold church in 1730, when a new church was built by the Old Scots congregation on White Hill in the present township of Manalapan (then a part of Freehold township), near the railway station and village called Tennent. His brother William (1705-1777), whose trance, in which he thought he saw the glories of heaven, was a matter of much discussion in his time, was pastor in 1733-1777.. In 1751-1753 the present "OldTennent Church," then called the Freehold Church, was erected on (or near) the same site as the building of 1730. In it Whitefield preached and in the older building David Brainerd and his Indian converts met. In 1859 this church (whose corporate name is "The First Presbyterian Church of the County of Monmouth ") adopted the name of Tennent, partly to distinguish it from the Presbyterian church organized at Monmouth Court-House (now Freehold) in 1838.